Who heads the Amish family? How many families are in an Amish church? Why is family so important to the Amish? How big is the average Amish family? Amish couples may have 10 children or more. Fifteen is not unheard of, particularly in more conservative affiliations. Family size varies across groups, but the average number is likely in the range of “only” six to eight children per family. Amish also have extensive extended families. Who heads the Amish family? As in other fundamental Christian religions, the husband is considered the head of the household, his wife his “helpmeet”. In theory this can mean dominant husbands and wives with little sway upon familial, financial and other decisions. However, it’s often the case that Amish women carry a lot of influence within their households, even if the husband is the outward head. Some Amish women have dominant personalities which flourish even within the bonds of marriage. In a well-functioning Amish home, Amish men often consult with their wives and in practice leave many decisions to them. How many families are in the average Amish church? From 25 to 35 is a common size range, though fledgling communities–or two churches following a natural division–can be smaller than this. And congregations may exceed 50 families as they grow toward the point of natural division when two church districts will be created from one (generally when the district grows to exceed 35-40 families). Amish churches are typically comprised of 25-35 families. Northeastern Indiana. 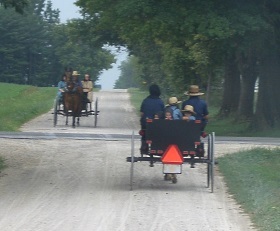 Amish congregations are limited in size by a few factors. One is the fact that Amish do not worship in church buildings, but rather use the home and other existing structures, such as shops and barns. This naturally limits the size of the church. Additionally, since Amish travel by horse-and-buggy or on foot to Sunday service, the geographical spread of the church is restricted. Finally, Amish believe in following the early Christian example of a small community of believers, in contrast to the “mega-church” phenomenon of modern society. Why is family so important to the Amish? Family, community, and church are three fundamental units in Amish society. Amish feel that raising children to be good Christians is their highest calling as parents. 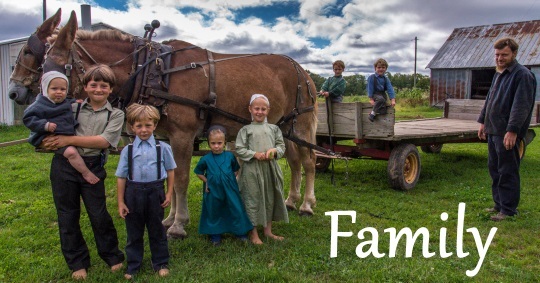 Though individual Amish families are not perfect and may have their own problems, they feel that a strong family life plays an essential role in their journeys towards Christ. To Cite this Page: Wesner, Erik J. “Family.” Amish America. Erik Wesner, 9 Apr. 2015. Web. [Date Accessed]. <http://amishamerica.com/family/>. how anyone can join this comunity ?